Happy New Year all! I love today's day - 1-1-11 - aaah, number patterns. Life would be so much more boring without you! I don't normally go in for New Year's Resolutions ... but in 2011 I do have some goals, so in the interests of accountability, I'll post them here. This is an activity I used to have to do when in graphic design college. I haven't been doing much art in recent years, and want to get back into it, and especially to improve my figure drawing skills. Producing one drawing a day - even just a quick sketch - will be a good way to get my "artistic eyes" working again, and while I know there will be days when I don't want to, it should hopefully also be fun. I will scan and post the occasional sketch here too. We don't have much debt, compared to many - a credit card that has got a bit out of hand (but no loans or mortgage). We have been living a bit beyond our means, I gotta admit. We have a pretty frugal life anyway (a necessity when we're living off 1.2 incomes) - no movies, no theatre, very few holidays, few restaurant meals, and so on. Most of our income goes on rent, medical bills, prescriptions, food, car costs, and other bills - and that part can't really change much. So 2011 will be a year of further tightening our belts, selling off some assets (second car, my recurve bow etc), buying more food from Aldi and less from Woolies, op shops, curbing the 'wanties', making do, being happy with what we've got (which is plenty! ), cooking from the pantry, homemade gifts, knitting from my (let's face it) extensive stash, reusing, recycling, saving, and not buying more books, yarn, cookbooks, kitchen gadgets and tools (my biggest weakness, actually), cool stuff online, and so on. We've been on this sort of regime many times in the past, so it hopefully won't be too hard to do. Having 3 of us at home instead of 4 should also help cut costs. Apart from cutting our debt, we're also saving for an energy-efficient fridge next year, and changing our fuel-inefficient old 1996 station wagon for a newer, smaller, fuel-efficient car. Aiming for a long walk, exercise bike ride, gardening, or a swim, or something, 3 or 4 times a week. While I really want to lose weight (the damned prednisolone has made me stack on the kilos, unfortunately, if inevitably), my main goal with the exercise is fitness. It's good for my hip, emotional well-being, and overall health. So, I'm not setting weight loss goals, they are too hard to achieve when on steroids, and I don't know how long I'll be on the meds. But being active is something I hope to be able to do. Best of luck with your plans. And remember, if something slips, you can always start in on it again. One skein of irresistable yarn will not blow your frugal intentions all to hell. YOu just begin frugalling again the next day. Good luck with your goals. They all seem very achievable. I only ever aim to walk The Labradors every second day, and 96% of the time I do more. I'm also with you on the belt tightening, I don't do very many of those things either, but I shall have to think smarter!!! 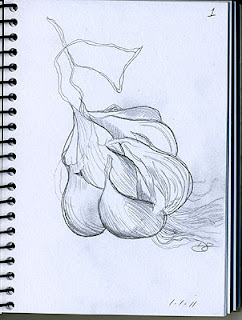 Nice garlic!!! I like nice achieveable goals, and I think these are! You can do eeet! Happy 1/1/11! I have modest goals for the year and exercise 3 times a week is at the top. I discovered I really do feel better when I exercise. Happy New Year and I think you are so right that we need to be happy with what we DO have instead of constantly wanting, whether being frugal is on our list of resolutions or not. 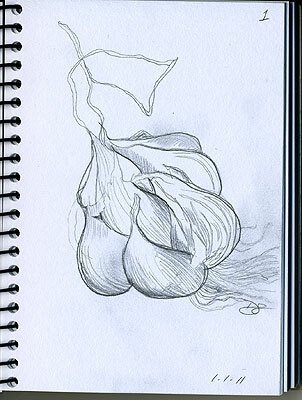 I used to draw a lot, and your garlic sketch made me realize how much I miss that.